This German-made .22 LR ammunition is the perfect rimfire load for target shooting. It fires a typical 40 grain lead round nose/solid bullet at 1,050 feet per second, putting it in the subsonic "standard velocity" category. As a standard velocity round, it delivers consistent accuracy and works well with suppressors. 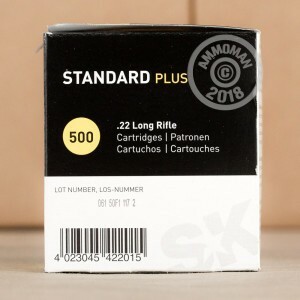 SK is the rimfire brand of Nammo, a Scandinavian ammunition manufacturing company. 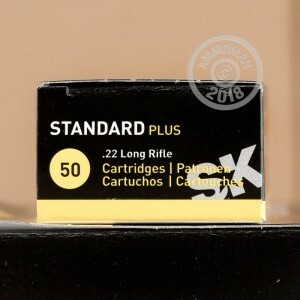 SK ammo is fairly cost-effective and is very popular for target shooting. Serious shooters will appreciate AmmoMan.com's free shipping promotion, which applies to all orders over $99 regardless of package weight. Pick up a few bricks of this rimfire ammo and enjoy the extra savings! 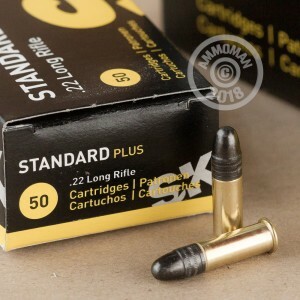 Bough standard velocity 22 long rifle ammo for use in my suppressed Ruger 10/22. Didn't know the brand but thought I would take a chance. I've shot a couple hundred so far without a hitch and it's a blast. the action cycling and the bullet hitting the spinner is all you hear. Service was great, in fact I couldn't believe how quickly it arrived. overall a great experience and I will order again.